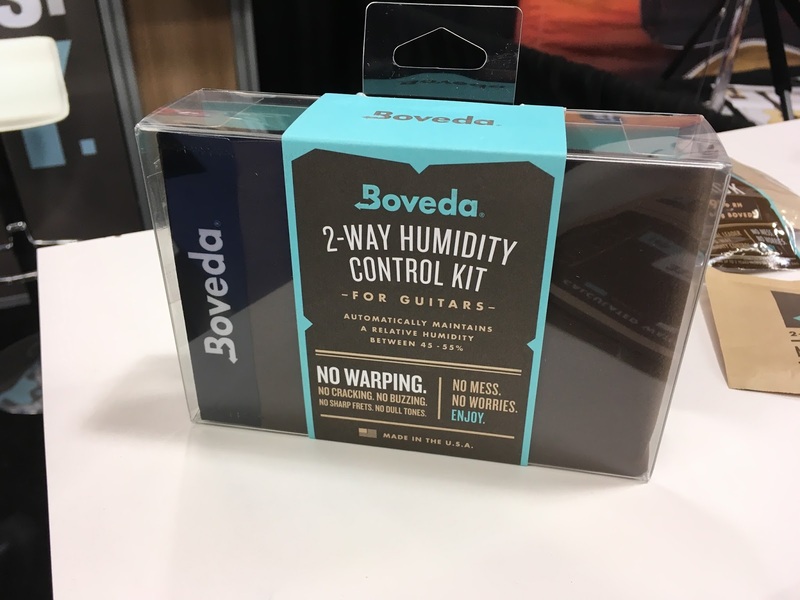 There have been desiccant packs and in-case humidifiers for years, but the user of these products has to know the what the actual humidity is to decide which solution to use, which can end up being a lot of work. 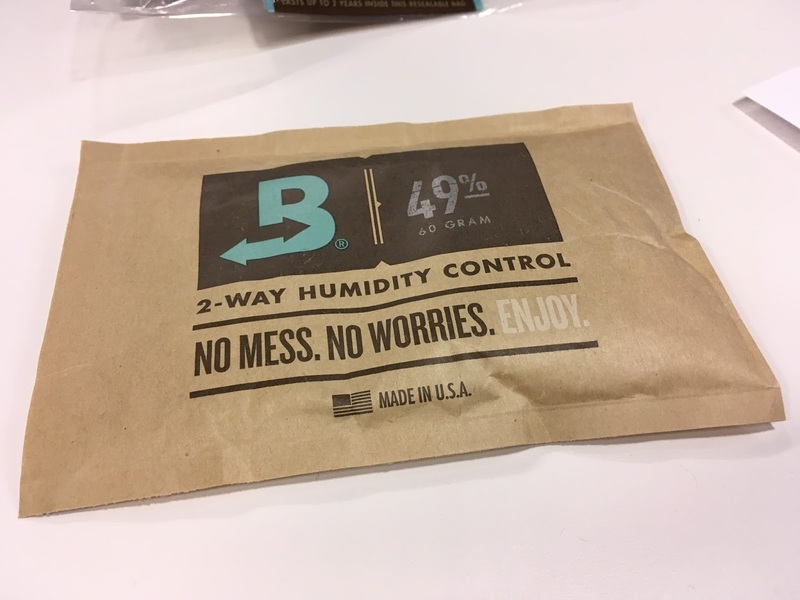 The best solution would be a product that works to achieve the optimal humidity without a lot of user input, and it turns out that there is a product like this out there: the Boveda 2-Way Humidity Control system. I thought the 2-Way Humidity Control system was pretty darned neat when I saw it last week as the NAMM show. 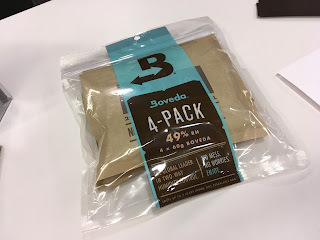 Jason, Boveda’s VP of Operations, took the time to walk me through the details of the science and how it is applied, and I am now a believer in this technology. This is an easy product to use, all you need to do is purchase the starter kit for $29.95, and you will be set within a few minutes. 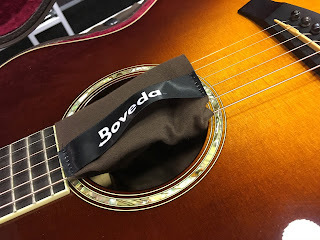 The kit includes four Boveda packs and two fabric holders. The packs are a paper-like material with a liquid in them, so they are kind of squishy. Put one or two of them in the fabric holders and hang them through the soundhole of your guitar or put them in the case and you are good to go -- nothing to soak, no hygrometer, and no drama. When it feels like the contents of the pack have dried out, it is time to replace it. This sounds kind of magical, but there is legitimate science behind this product. There are a few scientific principles that state that a saturated solution of salt in water will maintain a constant level of relative humidity inside an enclosed chamber. You can vary the salts or type of salts to achieve different levels of relative humidity (for guitars 45% to 50%), put this solution into a bag with a semi-permeable membrane, and it will be able to maintain that lever of humidity inside a closed guitar case. Thee are a few things to keep in mind, of course. The Boveda packs should last for 3 to 6 months, but if you have a wood case the first set will not last that long. The wood in the case can dry out, and it might need to be hydrated too. 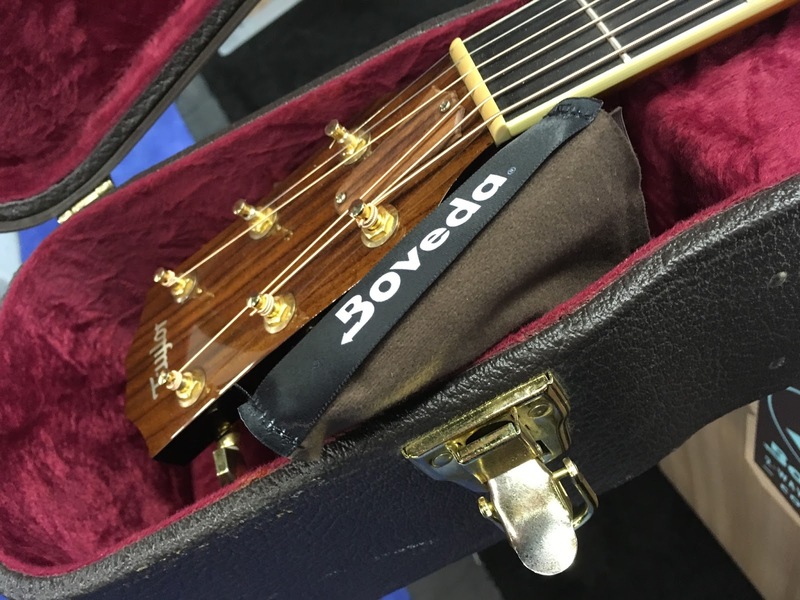 It is always a good idea to keep the case closed, even at gigs where you might leave it open, so it does not dry out again. It is not possible to overdo things with the Boveda packs. The more you put in the case, the longer they will last. The science will not change, and they will continue to constantly adjust to the target relative humidity. It is a good idea to use the fabric holders that are provided in the starter kit, as they are soft and will help contain leaks should you happen to poke a hole in one of the packs. Also, keep in mind that Boveda sells these products with different target relative humidity levels for tobacco, food storage, and herbal medicines, so make sure you order the right stuff.